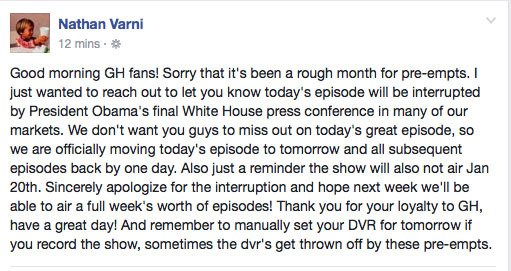 ABC Programming Executive Nathan Varni posted to Twitter outlining why “General Hospital” won’t air today. He also had some information on how following GH episodes would be affected. ABC will air live President Barack Obama’s final White House press meeting, cutting into GH’s 2:00 p.m. time slot in most markets, said Varni. Todays episode will move to tomorrow, and all following episodes will also move back by one day. See the full text of Varni’s full Facebook message below. There’s a lot going on in Port Charles right now, so it’s good to know when we can catching all the exciting action with the Naxie wedding, Olivia Jerome’s return, the Lulu/Charlotte drama, and more!